1 - Combine all ingredients in a large plastic bag, seal and shake until well coated. 2 - Empty bag into a 13x9 dish, cover and bake at 350 degrees for 35 minutes, stirring occasionally. 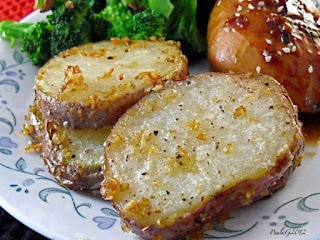 3 - Uncover and bake 15 minutes longer or until potatoes are tender. don't forget to share, like and comment our page facebook. WOW.... RED VELVET CHEESECAKE !!!! Amazing Apple Pie Tacos !! !